Many of the things on our TO DO list include home improvement projects. Since even before having Lincoln…say about 9 months before and then the additional “trying to conceive” timeframe, it’s pretty safe to say that we’ve been a bit distracted. (Y’know …we used to be those really neat ‘n tidy people.) And, as time has gone by, our list continues to grow. We are making small strides (i.e. tiny projects like this one we did in April), but time is limited with our work schedules, birthday parties, and an unexpected surge in weddings and funerals this year. This weekend we opted to switch the old fashioned track lighting in our kitchen with some simple pocket (or recessed) lights. We got started before Lincoln went down for a nap. This consisted of Christi on a ladder trying to do the drilling, measuring, etc. by herself while I ran circles around her chasing after Lincoln and shoo-ing away the dogs. I won’t insult you with actual instructions or tips on how to put these lights in as a DIY. First, because I really don’t think instructions should come from the self-identified “tool-getter” or “holder of things over my head.” And secondly, there are loads of legitimate DIY masters on the internet for just this thing. I pinned a few while researching, see? 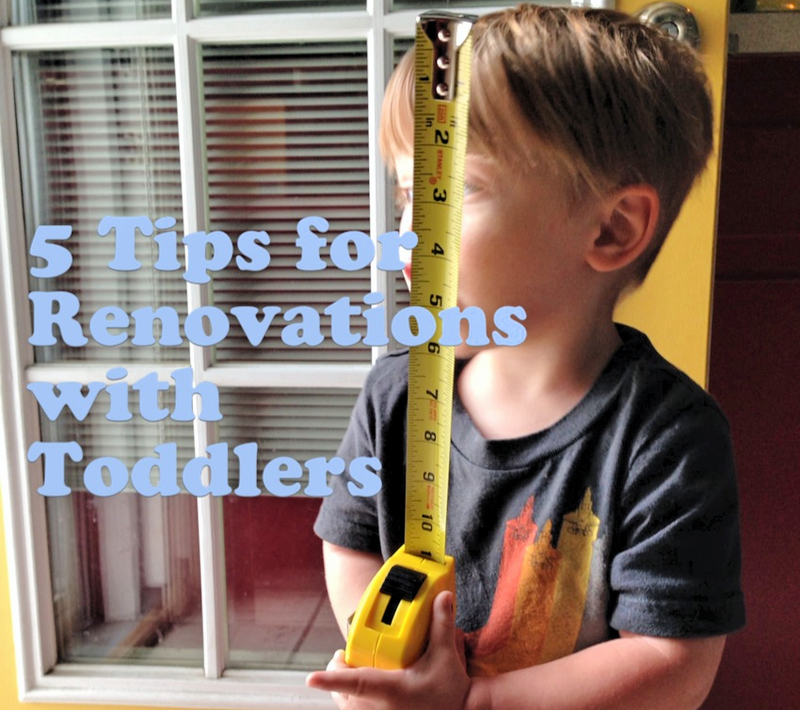 However, as it is the theme of this blog, I would like to share a “TOP 5” list for getting through the project WITH a toddler. This should pretty much be Step 1 for any list that involves either A) a toddler or B) a project. I mean really, who doesn’t plan ahead? With our little Recessed Lights project, this meant a lot of things: gathering supplies and tools needed, measuring, and reading any necessary instructions before getting started. But it also included taking care of the kid – timing the project around nap time (if possible) or even getting a sitter if it’s a larger project. #2. Keep an eye out. While Christi is busy doing the boring stuff (e.g. drilling, measuring, hammering…yawn), my job was to be an extra set of hands for her, but also to be an extra set of eyes for the kid. Whenever you are working with tools, keep in mind that things like an extra nail or plaster can fall from the work area. Kids love crap they shouldn’t have. Some kids love to put that stuff in their mouth. I know this is common sense, but it bears repeating. And this brings me to another important step. #3. Let your kid help. Most kids will want to help in some way and, if they are old enough to walk around and get into trouble, then they are definitely old enough to have a task. Before Lincoln’s nap, I asked him to help me pick up pieces of plastic that were left on the floor. They weren’t sharp or dangerous. It was just extra debris that wouldn’t be easy to sweep up. He loved it. Another task Lincoln loves is anything to do with boxes and packaging. In our case, we sometimes find that we are creating a bigger mess to ensure we give him a way to help out. And that’s okay. We unpacked the lights and took the important items out of reach while leaving the bubble wrap and cardboard all over the floor. Lincoln was a great help in picking up the extra packaging and stuffing most of it back in the original boxes. Even if you’re a whiz at home renovation projects and “tool getting”, everything becomes a bit more challenging when kids are involved. Expect there to be noise, distractions, and even temper tantrums. (I’m not just talking about the kids here.) If you find yourself getting frustrated, take a step back to let yourself calm down, and try again. Remember – if your kid is not napping, then he is learning something from you. You want to make sure he’s learning how to do things like completing a project or problem solving, not getting frustrated and throwing in the towel. Listen, there are days where things like going to the bathroom (without interruption) or remembering to put deodorant under both arms feels like an accomplishment. Even in our household where the adult-to-child ratio is 2:1, the simple dailies can become overwhelming on occasion. Anything beyond that deserves a celebration…even a little one. It’s not just about you. You want to teach this to your kids, too. It feels good to accomplish something. Setting a goal, making a plan, doing the work…and finishing what you started. It all adds up. So reward yourself for hanging in there and reward your kids for their hard work as well. I particularly like your tip about letting the little ones help. Great blog! Next Next post: Garden Update: Basil, Blooms, and First Beans!